The following are a few selected Web articles on Internet marketing, online advertising, branding, sales and marketing, and search engines. The websites are updated from time to time, so check back and be sure to click through for more information today to learn how to get your business discovered online. By-the-way, as you can tell, I got a little more creative with this Internet marketing posting. Sometimes it is wise to do something a bit different online to get your business story to stand out. This is a sample of marketing creativity in Internet action. Welcome to our new look for the online newsletter. There are some exciting things on the Internet horizon. There are many Internet marketing challenges facing businesses today. Let’s start the New Year off with the basic design requirements of any website. This sales, marketing, and advertising website link takes you to a website that is both simple and powerful at the same time. It is simply amazing what can be done with the new Blogger so.. ??? Professional Web Services, Inc. came into existence because of a belief that companies are not being properly marketed, advertised, or promoted with proper web site development strategies to reach their targeted audiences. Both B2B and B2C companies need to take advantage of the power of the various Internet marketing tools available. Many of the tools are sitting, just waiting to be utilized for free, both for the large corporations and sm.. ??? With 30% or more of the bulk unsolicited email marketing campaigns blocked by ISPs as spam, and people that simply throw emails away in the electronic trash can because they did not realize they opted in with one of the free software and information opt-in offers; email marketing using a paid mailing list to send out bulk email campaigns can hurt your company brand more than you know. New Business Launching You’re trying to get your new bus.. ??? Internet Marketing Services The term Internet marketing covers a wide array of online activities designed to improve the market reach of companies, websites, brands, and even individuals with the idea of promoting a particular company or person in relation to a particular professional industry. Attorneys, Doctors, Dentists, Realtors, and other professions are promoted and their brand image is expanded online. The reach can be global or loca.. ??? Hire Smart: Three Great Interview Questions to Hire Great Sales Staff For small business owners, good sales staff is absolutely critical; they can make or break your business. Unfortunately, salespeople are also the most difficult employees to retain, precisely because of their business value. When hiring a new salesperson, many employers fall into the trap of using industry experience alone as the key hiring factor. But if the candidate le.. ??? So now you are advertising your business, and are bringing in people but hardly any of them are becoming customers. What’s the problem? Is it the advertising message, the targeted audience, or the sales conversion process? Chuck McKay, an advertising and marketing consultant, who wrote a book titled “Fishing For Customers” and also writes in a blog by the same name Fishing For Customers , wrote an interesting article titled, The Flaw in the.. ??? Do You Know Your Customers and Buyers Semantically on the Internet? Are you talking their Internet semantic language? This issue of the online marketing report looks at the world of search from an inner perspective that is quite interesting. It gives fascinating insights into the way we communicate, artificial intelligence (AI), Web publishing, how search engines index and catalog the vast Internet library, and how computer programs using c.. ??? Branding, What Is It? By: James A. Warholic , President of Professional Web Services, Inc. It seems as though everyone has an opinion of what a brand or branding is all about. This blog is going to add our two cents worth of information to the topic. Let’s first start with the premise that Branding Matters for a B2B, Business to business, or B2C, Business to consumer company. If you subscribe to that statement then hopefully you will find s.. ??? Almost all of us do it. Many do it everyday. Many do it several times a day. We are all searching the Web for something. We use Google, Yahoo!, Microsoft Live Search, Ask, or any number of the other search engines available online. Are you taking your business for granted online? Many businesses are simply placing a website online and thinking that is all they need to do for their online presence. But, think about how everyone is using sear.. ??? Every business owner of a domain name in the world needs to be aware of the latest scam coming out of China and hitting the US and Australia. Chinese Company Wants to Register our Domain Name The US business owners are now being targeted with a very unethical form of domain name registration. This threat goes to the very core of a business’s identity and involves threats to the online brand identities of companies being targeted. I suspect .. ??? Contact us for Internet marketing strategies that will help your business standout on the Web. My Internet marketing timepiece message for the world wide web. 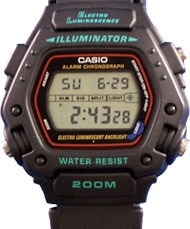 Yesterday, my favorite watch, the Casio DW-290-T, that I have had for ten or more years decided that it had had enough. It started out with, getting dimmer when the electro luminescent backlight was pressed. So I figured it was time to get a new battery. Driving over to the local Target store at 8:30 pm on a Saturday evening, it would simply be a matter of installing a new battery. As “Murphy’s Law” would have it, when dealing with time, this was not going to be the case. My first clue that this was going to be an extended visit should have been when I approached the watch counter and asked for a battery for my Casio watch. The clerk behind the counter asked me, “do I know the battery model number?” “Well sure, just let me borrow your small phillips screwdriver and I can give you the battery model number,” I said. The sales clerk said, “we no longer have any tools to work on the watches.” “OK…, let me see if my trusty Leatherman multi-purpose tool had anything that would work,” I said. Fortunately, the screws on the back of the watch were both slotted and phillips style. I had a small screwdriver on the Leatherman that worked just fine. After I got the back cover of the watch off, the clerk was able to see the battery number. She provided a new battery at the cost of four dollars and some change. I thought this would be great. I’ll be back in time… Foolish me. While I was assembling the watch back together, the clerk asked if she could recycle the old battery for me. I said, “sure.” Big mistake. The new battery would not work in the watch. Or, should I say the watch would not work with the new battery. Making sure the battery was in properly, pushing buttons, taking it in and out again several times, had absolutely no success in getting that stupid watch to function again. Now my favorite trusted timepiece became a stupid timepiece. The sales clerk during this time was helping out other customers and would occasionally come back to my counter area. She felt bad this had happened. I assured her it was not her fault. I stated to her, “Let me try my old battery, at least that one was functioning before I took it out.” “Well, um, let me see if I can find it,” she said. At that, she went over to the container of old batteries, which contained about a hundred or more of various types and sizes of batteries. She said, “I think it is this one. The one on top. But, I can’t get it out.” So, I start digging, and digging. Getting frustrated, I dump out the whole jar on to the counter. Separating the same style battery as mine into a pile. Only a dozen or so of that style batteries were present. I start trying battery after battery with no luck. No display at all. Murphy’s Law finally took its toll on my time. Time to move on. Get a new watch. OH, how I hate shopping for watches. This one had too many buttons and was hard to figure out. Another had a display that could barely be seen, unless you had the eyes of a 18 year old. I just couldn’t seem to find the right timepiece. “How late are you open,” I asked the clerk. “10:00 pm,” she responded. “OK, I might be back,” I said. Trudging over to the local Longs Drug Store, where I had remembered that they also carried watches, I decided to give them a try. I finally found a watch that I could see with my own eyes, the buttons had just the right touch, and it did not take a rocket scientist to figure out how to operate it. I am sure that many of you can relate to the time story. What is interesting is how this time story relates to matters on the Web. The Internet is a media outlet for B2B, B2C, and C2C. It is a marketing, advertising, and sales channel that really is difficult to encapsulate into one definition. Many B2B and B2C businesses want a website presence without doing much work. They want instantaneous gratification with an immediate website presence, that their website is showing up in the top search results for their marketing keywords, and the website becomes a powerful sales and marketing tool for their sales people to use. Time and time again, Presidents, CEOs, owners, and management of both large and small business fail to realize the amount of time it takes to develop an online web presence. Developing a good web presence encompasses so many aspects of a business’s soul in order to have a successful online presence. Time is the one item that will definitely be at the forefront of setting up and maintaining a website, Internet marketing, advertising online, and web branding the company across a wide area of online distribution channels. If the company is involved in a vary narrow vertical market segment or technical engineering area of expertise, then writing, or at the very least supplying an outline of the topic, from company staff will be a prerequisite for developing a good website. Good Internet marketing companies can provide immense help in the area of writing and editing content for selected keywords, fine tuning from a search engine optimization – SEO and Web branding perspective, online advertising strategies, search engine marketing, customizing and/or designing search engine friendly website templates, and Web branding strategic marketing ideas. But, marketing online still comes back to the business of sharing knowledgeable information, in a customer centric way, through good writing styles and online communication skills. Talk with Professional Web Services today for information about Internet marketing services, ethical search engine optimization, search engine marketing, online advertising strategies, and web branding solutions. Contact us for B2B and B2C marketing Internet marketing services, strategies, and solutions.